In a remarkable leap, FIDE president Kirsan Ilyumzhinov passed Vishy Anand and Veselin Topalov to take the #1 spot on the April, 2006 FIDE rating list that was released yesterday. His new rating of 2852 surpasses Topalov by an amazing 48 points and also overtakes Kasparov's record of 2851, achieved in 1999. This unprecedented Elo jump was due entirely to Ilyumzhinov's success in the little-publicized "Kalmykian Savings Bank Jubilee Tournament" held in Elista last November. Right: A photo from the event. Ilyumzhinov's opponents couldn't handle his sideways approach. Several participants complained on condition of anonymity about the conditions, especially the sofas and the use of the FIDE president's latest idea to popularize the game in America, edible cake boards and sets. 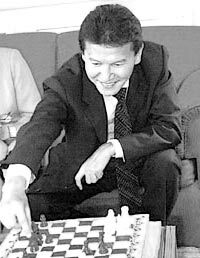 Ilyumzhinov dominated the four player, thirty-round match tournament to take the one million dollar first prize. He easily outpaced opponents Zurab Azmaiparashvili (GEO, 2669) 2nd place, $500,000; Georgios Makropoulos (GRE, 2382) third place, $250,000; and Ignatius Leong (SIN, 2225) fourth place, $100,000. (Prizes do not reflect the 20% FIDE tax.) Games are not yet available. This outstanding triumph has also made Ilyumzhinov the new frontrunner in the Chess Oscar voting. He now leads Topalov with 2,184,477 first-place votes to 1,388. Not nearly as good as Chess Today, I'm afraid, tough competition this year. Bah, I did the "super championship" thing with Fischer and Kasparov (and Deep Blue) at KasparovChess.com for April Fool's in 2000. Almost exactly the same as described by Chess Today, just one player different. Plus, FIDE has taken all the fun out of announcing fictional events. Cornered the market, as it were. Ultimate World Chess Championship Announced! 10 Million Prize Fund! Super Match Tournament for Unification! "Finally, the event chess fans around the world have been clamoring for! On April 1, the newly formed consortium "Brain and Internet Games Olympiad of Sport" (BIGOS) announced the Ultimate World Chess Championship!" "Of the players, of course the recluse Bobby Fischer has attracted the most attention. His return to the chessboard was presaged with remarks intended to clear up what he says were simple misunderstandings. "I know I made some strong statements in recent interviews, but they have been misinterpreted by the press, who are as bad as sheep. And that�s what I�ve been saying all along! It�s those damn ewes! They won�t leave me alone, that�s why I�ve been on the lam." World Champion Veselin Topalov leads Top Players in the 1st April 2006 FIDE Rating List. By FIDE regulations, Garry Kasparov, who has been inactive in the last 12 months, is not included in the Top Player List." Hopefully, it is not a joke. Finally, we are free! Yes, free from having to say "#1 active player" etc..
Mig, did you really say "Bah"? I always say "Bah." Unless it's "baaaahhhhh" as in the context of the Fischer item. Occasionally, "tosh." from google: "Fell for our April Fool�s joke, in which case ha ha, wasn't that amusing and harmless and mostly in good taste and not all psychologically damaging under various and sundry aspects of contemporary tort law, please don't sue us;"
It would have been more obvious that its April fools if you said he allowed people of Jewish descent to play. FIDE needs a new president. After the "World" championship in 2004 Adolf Ilyumzhinov needs to go! Susan Polgar has won the Chess Oscar three times and Kirsan only once? Something smells fishy here. The "sideway approach", finally a real answer to booked-up preparation, premature draws and computer supremacy. Surely, Ilyumzhinov will be re-elected now! Now Kirsan will be invited to play in lots of tournaments and will decide that he'd rather make money winning tournaments than be president of FIDE. The whole chess world rejoices. Mig, thanks for keeping us updated on all the important stuff. this is great. Now Kirsan will find out how hard it is to live as a professional chess player. and he will find out how little FIDE does for its players. Mig, I love it! It's a scream. I can't wait for the "three-way dance" (utilizing the new FIDE sanctioned sideways approach) between Kirsan, Topalov and Kramnik to unify the WC. The guest referee will be Vince McMahon. Really? That'd put Hitler's rating up close to 2900!! I don't really believe that you may experience material difficulties at 2852. Over 2600 every chess players reaches good if not excellent living conditions. Rouslan, I completely agree about 2852, but saying that getting over 2600 is enough to achieve good living conditions is a little bit too optimistic. One can make a living at that level, but not a very good one, unless there are some special deals or sponsorships. This is the reason why many talented players choose other careers over chess. Doesn't look like any more of a joke than half of the last ten FIDE ideas. I see Israel has signed on to Kirsan's candidacy. So.....Israel has evidently reconciled itself to Kirsan's hosting the WCC in a country (Libya) which wouldn't allow players with Israeli passports? This page contains a single entry by Mig published on April 1, 2006 9:17 AM. Moro & Anand Win Amber 06 was the previous entry in this blog. Dominoes on ESPN is the next entry in this blog.